Abstract: How do we think globally as musicologists? Recent attempts to write global histories of music raise various issues about how we should relate as scholars in a global community, and questions whether as scholars we truly understand the nature of music given the new a global perspective. Thinking globally is a key challenge. There is a strong possibility that we may fail, but taking up the challenge is like to spur our discipline forward in unexpected ways. Abstract: In the twenty-teens, music has been wrapped up in politics and ethics in several prominent events, including violent attacks at the Bataclan theatre in Paris and the Pulse Nightclub in Orlando, and the profiling of musical listening habits in the French governments “stop jihadism” campaign. Significant scholarship exists on music and politics, and interest in music and ethical philosophy is growing. More work, however, is needed in theorizing the connections between music, ethics, and politics. In 1951, Heidegger’s essay “Building Dwelling Thinking” lists the words in the title without punctuation in an attempt to show how these three terms are intertwined even though they are often considered separate. While these words and concepts are not interchangeable, each relies upon or invokes the other. My title structurally mirrors Heidegger’s, and my aim here is to elucidate how music is intertwined with ethics and politics. Abstract: During the Second World War, composers in neutral Switzerland were not faced with the same difficult choices as their colleagues in occupied Europe, but most nevertheless refused to do anything to antagonise the neighbouring fascist regimes. The Swiss composer Richard Flury (1896–1967) was an exception: he worked with numerous anti-fascists and Jewish emigrés and even offered a job to his friend, the conductor Gottfried Kassowitz, in an (unsuccessful) effort to get him out of Nazi-occupied Vienna. Abstract: The article is a discussion of Goran Kapetanović’s work Sažeti prikaz neumitnog i tragičnog toka sudbine koji je krhko biće Male Sirene odveo u potpunu propast (A Brief Account of the Inexorable and Tragic Course of Destiny that Led the Fragile Being of the Little Mermaid to Total Disaster). This multilayered postmodernist work from the closing decade of the 20th century is discussed here from several perspectives: as a postmodernist intertext, as a drama (tragedy), and as a hypertext in relation to Stravinsky’s Petrushka, which Kapetanović used as the model and hypotext for his own piece. Abstract: In the sphere of musical research, the intersection of two seemingly very different subject areas – music and mathematics – is in essence related to one of the trends of music – attributing the theory of music to science, to the sphere of mathematica. It is regarded the longest lasting interdisciplinary dialogue. The implication of numerical proportions and number sequences in music composition of different epochs is closely related to this sphere. A significant role in creating music was attributed to the so-called infinite Fibonacci sequence. Perhaps the most important feature of the Fibonacci numbers, which attracted the attention of thinkers and creators of different epochs, is the fact that by means of the ratio between them it is possible to come maximally close to the Golden Ratio formula, which expresses the laws of nature. On a practical plane, often the climax, the most important part of any composition, matches the point of the Golden Ratio; groups of notes, rhythm, choice of tone pitches, grouping of measures, time signature, as well as proportions between a musical composition’s parts may be regulated according to Fibonacci principles. The article presents three analytical cases – Chopin’s piano prelude, Bourgeois’ composition for organ and Reich’s minimalistic piece, attempting to render music composition structure to the logic of Fibonacci numbers. Abstract: Cette contribution qui traî te un pan de la musique contemporaine issu de système algorithmique, sce réfère à la dialogique du simple (l`indivisible) et du complex (le composé) démontrant quelques types catégoriels métaphoriques musicales par le phenomène de la fractalité. Il s'agit des métaphores au niveau temporel, au regard du domaine spatial, au plan du comportement spatio-dynamique, au regard du domaine discontinu ainsi qu`au niveau topologique. Les exemples proposés pour chaque métaphore relatent du pensée de Benoît Mandelbrot qui confirme que les parties, les paramètres ont la même forme que le tout, à ceci près qu`ils sont à une échelle différente. Music (2012–) and Zaldua’s Foreign Languages (2013–17). The moment-to-moment sonic details of the works are undefined and are discoverable only as they unfold, highlighting the unpredictability of sometimes highly prescriptive music. Bergson’s (1889;1910) Time and Free Will outlines the distinction between time as units of duration and ‘real duration’, which is the experience of time passing in the present. In the latter case “several conscious states are organised into a whole, permeate one another, gradually gain a richer content” (1910, 122). The duration of Spahlinger’s Eigenzeit from Vorsläge (1992–93) is determined by its processes, which are undetermined until they are enacted. Stone furthers this in As sure as time... (2016–) by imagining each performance as a unit of duration in a theoretical meta-performance. These pieces show how the performance of temporal process makes concrete the quantitative nature of duration and shifts the focus of the listener to vertical time. Keywords: time, performance, process, Bergson, Kramer. Abstract: This article examines the implications for aesthetics of using music as a model. It pursues the question of how music could stand as the paradigm of art in general as a cultural practice. Abstract: The subject of this paper are the songs written and sung in Serbia during the National Liberation War fought on our territory during World War II. The focus is on Partisan song variants, among them the song “Krajinski smo mladi partizani” [We Are the Young Partisans of Krajina] from the Zaječar region particularly stood out and became a well-distinguished one. Having become quite popular, this song used to be sung during the National Liberation War in the Partisan troops, on marches, at performances organized by the Liberation War supporters, and after the Liberation, throughout Yugoslavia. The paper mainly features its numerous variants. Dimitrije O. Golemović – WAS MOKRANJAC THE FIRST SERBIAN ETHNOMUSICOLOGIST? Abstract: The question posed in the title of this article stems from the widespread belief that on account of his work in collecting folk melodies for his Rukoveti (Руковети; Garlands), Stevan St. Mokranjac (Стеван Ст. Мокрањац) gained a place among Serbian ethnomusicologists; since ethnomusicology is still a young field in Serbia, the author puts even more emphasis on that belief by asking whether Mokranjac was Serbia’s first “real” ethnomusicologist. After establishing clear criteria that define an ethnomusicologist as a scholar, including, above all, fieldwork, transcription, analysis, etc., and studying Mokranjac as well as other cultural workers (Vuk St. Karadžić and Vladimir Karić), as well as Mokranjac’s successors (Vladimir Đorđević, Miloje Milojević, Miodrag A. Vasiljević, and D. Dević), the article concludes that the first Serbian ethnomusicologist was in fact Dr. Dragoslav Dević (Драгослав Девић). This ethnomusicologist and long-time professor at the Music Academy (today the Faculty of Music) in Belgrade is a true example of a scholar-ethnomusicologist who engaged in multiple activities that, in addition to those mentioned above, also included the tonometry of the folk-music material he collected, as well as something that his predecessors lacked – paying due attention to the living context of that music, especially the rituals and customs. Furthermore, Dević paid ample attention to traditional music instruments, shedding light on many of them from the aspect of their main features and thus leaving valuable recordings of their existence and function in Serbian traditional music practice (works on the bagpipes, ocarina, cevara (цевара), rikalo (рикало, shepherds’ trumpet), as well as on various instrumental ensembles). Abstract: The composition Toba for Symphony Orchestra by Branka Popović, according to the composer’s own words, is a piece that “invokes the movement and energy of volcanic activity (...)”. Over time it develops as a directed movement, with the reproduction and reduction of texture content. Such a shift of different intensities, realised on a kinetic and colorful plane, leads to the constant flickering of the sections and to the creation of a kind of rhythmic texture that retains the melodic and harmonic musical properties. The movement through music time is always accomplished in the same way: a strong impulse of prolongation leads to an intensified texture movement and accumulation of energy that is released in one instant. Such a concept is disrupted at the moment of the intrusion of a contrasting section in which a circular motion occurs that is caused by the appearance of repetition. Not only will the specifics concerning the perception of music time be considered in this composition, when discussing the principle of the construction of temporality and movement. The time flow of the stylistic references of the work neutralised by the appearance of the texture itself indicates the authenticity and the specific stylistic determination of this composition. Keywords: temporality, movement, prolongation, accumulation, resolution, repetition, postmodernism. Abstract: This paper offers an analysis of Duality in Time for flute and violoncello by Californian composer James (Jim) C. Scully (b. 1972), which was composed for a composition competition in 2009, for the which the composer had 60 minutes to write the piece and the performers 60 minutes to rehearse it. The analytical observations focus primarily on melody / motives, pitch collections, vertical sonorities / harmony, rhythm, form, texture, and instrumentation. The paper includes an analytical score of the composition. Abstract: The objective of this work is the discovery and analysis of teleological strategies, i.e. the ways in which music which is not tonal-oriented finds points of orientation, how it is structured around them and directed towards them as formal supports. A modernist composition Octandre by Edgar Varèse which is composed for seven wind instruments and double-bass will serve as an analytical sample. An important element of the composition is the use of sound masses as basic building units, whose expressive meaning is within the general character of the sound, and not in the concrete melodic content. Seemingly, the relevance of individual pitches is minimized, which could indicate the possible statics and absence of goal-oriented movement. However, the analysis has discovered an orientation towards certain goals, as well as the crucial importance of parameters of pitches during the process of their realisation. By tracking these processes, as well as by analyzing the sets from which the sound masses of the work are built, it will be concluded that the analyzed work rests upon advisedly elaborated compositional strategies that make its course targeted. 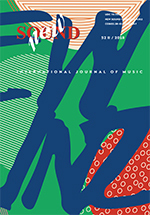 Abstract: This study investigated whether and how the musical palindrome (tonal, melodic and metric) can be recognized in auditory and/or visual perception in musically trained participants. According to the results, we suggest that palindrome recognition can only be aurally perceived if it is short enough and the listener is quite sophisticated. There is a fair amount of research on the recognition of transformed auditory and visual patterns, as well as the visual symmetry perception in persons with ASD. Thus, a future study will test more people with ASD, on one hand, and musically trained participants recognizing short musical palindromes. Abstract: This text features the status and importance of poetry in the output and opuses by Dejan Despić, based on the composer’s view that “poetry is, in fact, merely unsounded music, that is to say, that music is, in fact, merely unspoken poetry”. Transposing poetry into vocal shapes and achieving a specific mosaic-type dramaturgy will be explained on the example of turning miniature texts into music – Ozon zavičaja [The Ozone of the Homeland], op. 105 (a cycle created to the verses of Desanka Maksimović) and Krug [The Circle], op. 61 (composed to the verses of authentic Japanese poetry). Abstract: In Munch’s painting entitled Der Schrei der Natur (1893), a figure, while walking on a bridge, feels the cry of nature, a sound that is sensed internally rather than heard with the ears. The Scream is thought to be the ultimate embodiment of fear, angst and alienation. It is also thought to symbolize humanity’s existential panic expressed by ugly, even hideous, sounds of living beings undergoing both physical and emotional suffering in the modern age. As a motive, the so-called Ur-schrei is manifested mainly, but not only, in expressionist literature, painting and music, in order to articulate the most intense human emotions. In this article, I will present and analyze aural and visual manifestations of the Scream in music and painting. Keywords: scream, primal scream (Ur-schrei), expressionism, atonal music, idea of man’s alienation from nature. 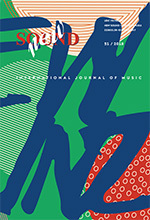 Abstract: This paper is based on the assumption that Goran Bregović’s transition from Yugoslav rock star to contemporary Balkan composer, as he defines himself today, has unfolded via the appropriation of the different strategies the music industry (MI) devised in its own, bumpy and often contested, but undeniably technologically constituted transition and transformation during the last decades of the 20th and at the beginning of 21st centuries. Notable for his usage of existing (mainly traditional) music even in his rock years, Bregović actually developed some peculiar modes of production that almost neatly matched the MI strategies not only of production, but of distribution and consumption as well. Hence, I shall address the possibilities of interpreting Bregović’s creative/production procedures, here defined as recycling, remediation, and reformatting as appropriated music industry production, distribution and, naturally consumption strategies, show-casing his music for Emir Kusturica’s Underground and the pop song(s) emerging from it. Abstract: This impressionistic essay is indeed an attempt to record the thoughts I developed on improvisation while visiting different places in Belgrade, meeting various musicians who are living in this city, and reflecting on a few texts dealing with musical improvisation. In seven short meditations, seven “stops”, I criticize the anthropocentric discourse around improvisation, formulate ideas about improvisation that try to overcome dichotomous constructions, and trace improvisational structures in sound art, rock music, contemporary composed music, and everyday listening. Abstract: The purpose of the text is to present, on the occasion of the 10th anniversary of the establishment of the Serbian Musicological Society (SMS), the circumstances of its founding on 5 July 2006 and offer a panoramic survey of its accomplishments in research and publishing so far, which re-examine our stance toward our musical heritage and/or illuminate previously neglected chapters from the history of music in Serbia. The many and diverse contributions of the Serbian Musicological Society to the achievements of Serbian musicology in general are reflected in its conception and organization of scholarly meetings, publication of essay collections, scores, and sound recordings, organization of concerts, as well as initiation of large-scale projects in the reconstruction of individual anthological works of stage music, independently and in collaboration with related institutions and opera houses. Abstract: Opera has been a major and vital element contributing to the firm establishment of the Greek National School during the first decade of the 20th century, following the trends of other national schools appearing around or before that time. The national element has been present in several cases and although the Greek National School was firmly established in 1908 with a manifesto that was presented by Manolis Kalomiris, the Greek operatic world dealt with the patriotic sentiment long before that. During several periods in the 19th and 20th centuries, historical circumstances gave composers the opportunity to express themselves through the notion of the heroic, directing the subjects of their works towards the awakening of national pride, contributing to the nationalistic ideas that were developing during each period. Heroism and heroic deeds of the past were the perfect materials for this purpose. Aleksandra Gartnar – Maglov, Marija. The best of: umetnička muzika u PGP-u. Beograd: Fakultet za medije i komunikacije [The best of: Art Music in PGP. Belgrade: Faculty of Media and Communications], 2016. ISBN 978-86- 87107-68-7. 132 pages.